New Orleans Jazz Funeral Band. Dixieland Jazz Band For Funerals. An Experienced Jazz Funeral Band For New Orleans Funeral Processions. This dixieland jazz marching band that has played for over one hundred funerals is available to hire to bring their experience to your loved ones funeral procession and service. Steve Strange's Funeral on 12 March 2015 Daily Mail Report showing this marching band and ITV's Report of the day. This funeral jazz band leads the cortege to the church service. A funeral is a difficult occasion for all concerned, this New Orleans style band can help you select the music to be played at a funeral, to either, celebrate the life of your loved one or, to mark their passing with the music they enjoyed. At funerals in New Orleans the band plays somberly with spirituals and funeral dirges on the way to the cemetery, the procession is led by a Parade Marshal, to clear a way through the crowds, followed by the jazz funeral brass band*. After the committal when returning to the reception party the music is played joyfully to celebrate their life. For jazz funerals in the UK most people ask the band to play upbeat music going to the interment as a celebration of their life and possibly again afterwards at the wake. In England the Funeral Director usually takes on the role of the parade marshal as seen in some of the pictures on this page. as up tempo lively music. Book this jazz band for funerals. These experienced musicians have been hired to perform live music for funerals in England, leading the procession playing New Orleans jazz in front of the cortège, or playing the deceased's favorite songs during the service whether religious, humanist or secular. They can play at the graveside and very often play at the reception or wake afterwards. Acoustic Jass in Barry, South Wales. The tune is "When The Saints..."
filmed by and used by permission of GRJ Media Ltd. The tune is "The Old Rugged Cross"
The band performing after the Service. For most families the organisation of a funeral is not an easy thing as they are not only upsetting to the family members but happen at short notice. 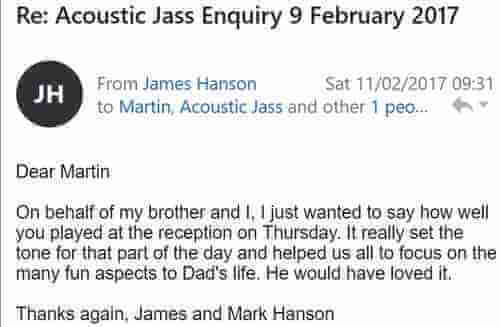 Acoustic Jass are able to deal with either the family members or the funeral director during the booking process. This jazz band has performed at over one hundred funerals so their experience enables them to offer suggestions to help the funeral run smoothly. Many people have been inspired to have a jazz band after watching the James Bond film "Live and Let Die" where a funeral procession appears with the brass band playing the spiritual "Just A Closer Walk With Thee" as a dirge, there is a fatal stabbing and they carried the body off to "Joe Avery's Piece" an up tempo parade tune. Acoustic Jass has often been asked to recreate this "but without the stabbing". The tune is "Lily of The Valley"
*The New Orleans brass band is totally different to the British brass band in as much as they use a mixture of brass instruments and woodwind and play in the jazz idiom.